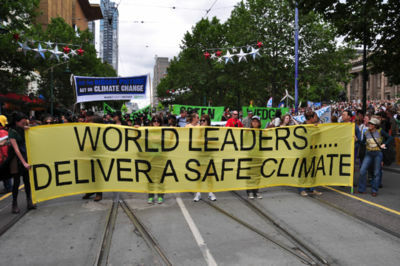 - The '''2009 Walk Against Warming''' was held in several Australian cities on December 12, 2009. 10,000 people attended the rally in Melbourne, Australia.<ref>[http://www.theage.com.au/environment/climate-change/thousands-gather-at-climate-change-action-rally-20091212-kpbg.html Thousands gather at climate change action rally] The Age, 12 December 2009</ref> Speakers urged the Australian government to participate in the creation of a binding international agreement to reduce global greenhouse gas emissions and set strong emission reduction targets at the [[Copenhagen Climate Change Conference 2009|Copenhagen Climate Change conference]] in progress. + The '''2009 Walk Against Warming''' was held in several Australian cities on December 12, 2009. 40,000 people attended the rally in Melbourne, Australia.<ref>[http://www.theage.com.au/environment/big-numbers-warm-to-climate-cause-20091212-kpq2.html Big numbers warm to climate cause] The Age, 13 December 2009</ref> Speakers urged the Australian government to participate in the creation of a binding international agreement to reduce global greenhouse gas emissions and set strong emission reduction targets at the [[Copenhagen Climate Change Conference 2009|Copenhagen Climate Change conference]] in progress. + Plea from Leah Avene from Tuvalu for global climate action at Melbourne Walk Against Warming 2009. This page has been accessed 28,577 times.